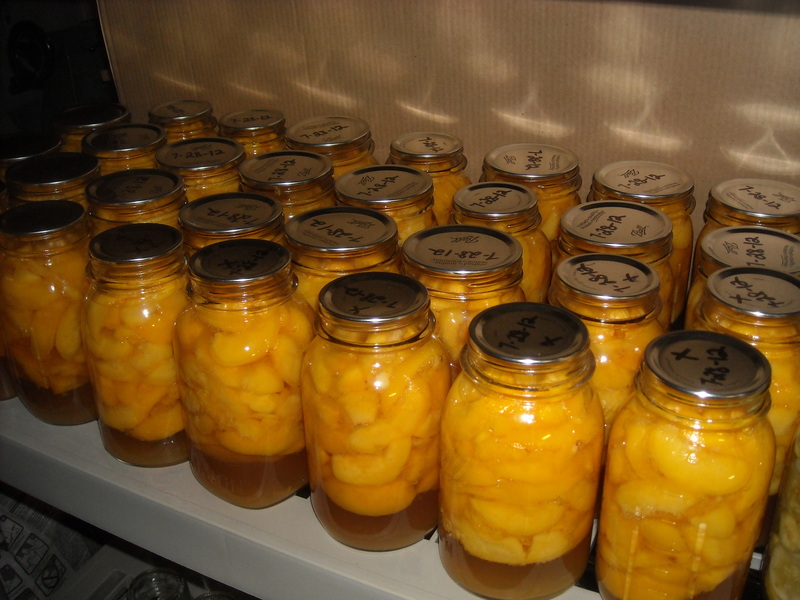 I have been canning peaches at home for that past several years. I still consider myself a novice, but I have learned some things along the way that I think will be helpful to those of you wanting to pursue this particular method of preservation. 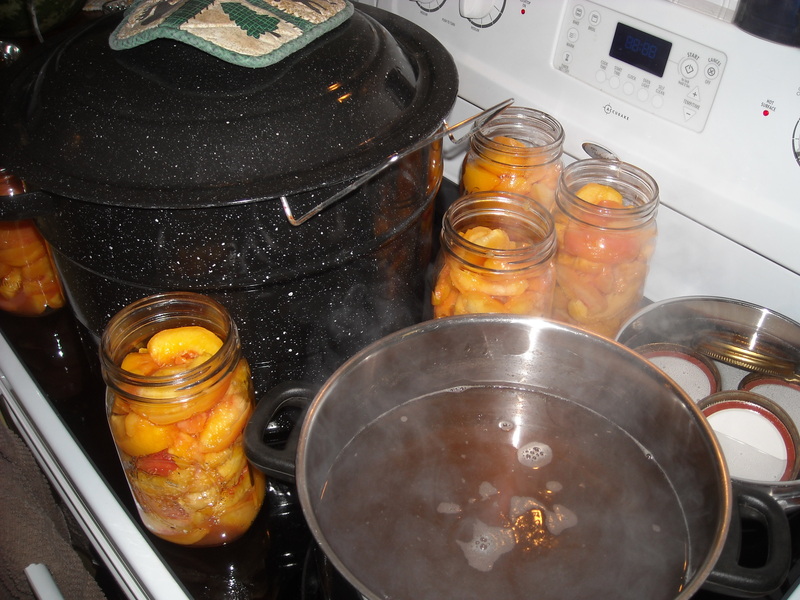 In my opinion, canning yields a much more user-friendly result than freezing peaches. Frozen peaches tend to be rather mushy when they thaw. For some applications (i.e. baby food, purees, etc) that’s not a problem. For use in pies, cakes, or just for eating, I think canning is the way to go. It is a bit time-consuming, but well worth the effort. We are lucky enough to live near a family owned/operated orchard that practices environmentally safe pest control. We purchase a variety of fruits from them year-round and have found the quality to be far superior to anything found in the grocery store. If possible, I recommend you look for a local grower if you are considering canning. You will not only save yourself money, but you will most likely end up with a more flavorful product. 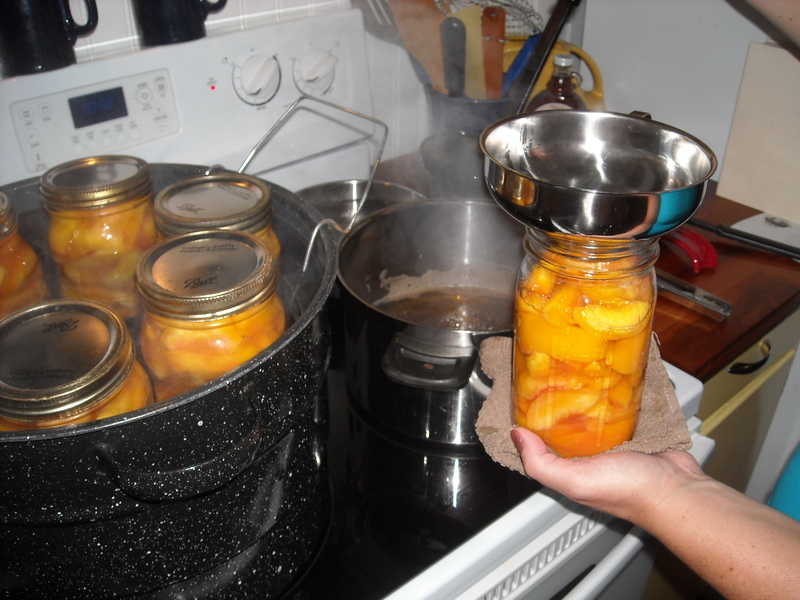 As you can see from the picture above, the first step in the canning process is to allow the peaches to ripen. Be sure to lay the peaches in a single layer and leave a little space between each one. Check the peaches daily by giving them a gentle squeeze ( you can also do sample one or two to check progress!). You want the peaches to be ripe, but not overripe. We chose Red Haven peaches because they are a free-stone peach that’s firm and flavorful when ripe. The next step, as shown above, is to loosen the skin from the peaches. To do this, you submerge them in boiling water for 30-50 seconds. You then immediately move them into an ice bath (sink or large bowl filled with cold water and ice) to stop any cooking. 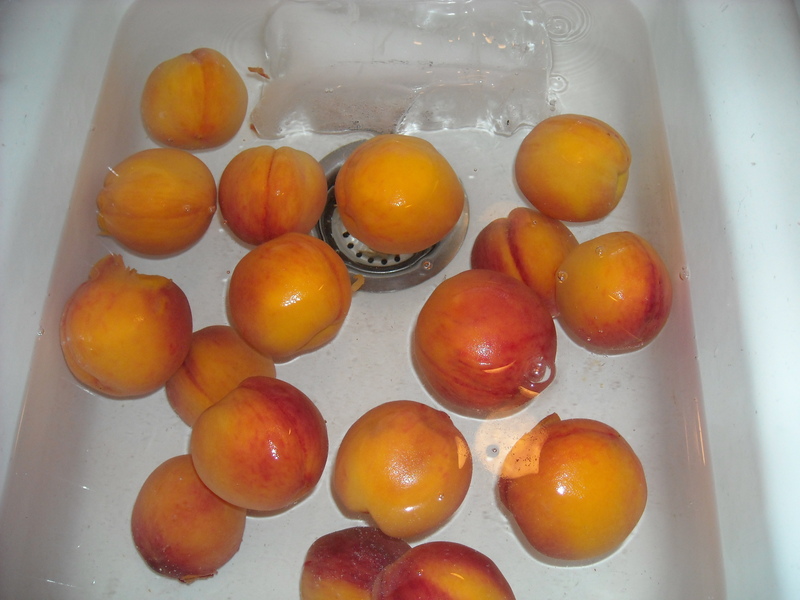 After a minute or so, the peaches can be removed from the ice bath and you can begin preparing them for jars. First, remove the skin. The skin should slide right off. If it doesn’t, you probably did not leave the peach in the boiling water long enough or you are working with an under ripe peach. After the skin is removed you will need to decide if you want to can the peaches in halves or in slices. This year, I chose slices. I sliced the peaches into 1/2-3/4 inch pieces. 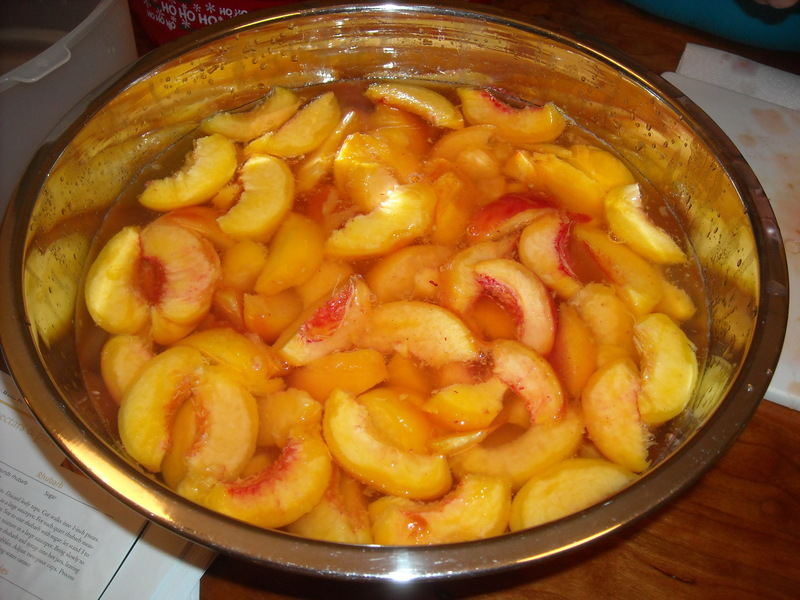 As I was working, I put the peaches in a solution of “Fruit Fresh” and water to keep the peaches from browning. The Fruit Fresh can be purchased at the grocery store. Just follow the directions on the label. You will drain this solution off before canning. If you choose to do halves, simply remove the skin, cut the peaches in half and remove the pit. Soak in the preserving liquid as I did above. 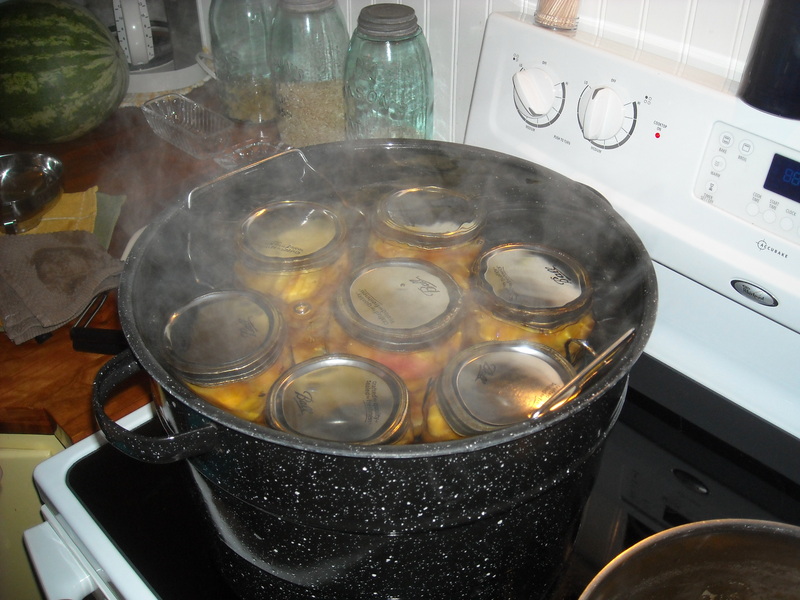 Keep in mind, that if you do can the peaches in halves, it is best to use wide-mouth canning jars. The are much easier to fill. 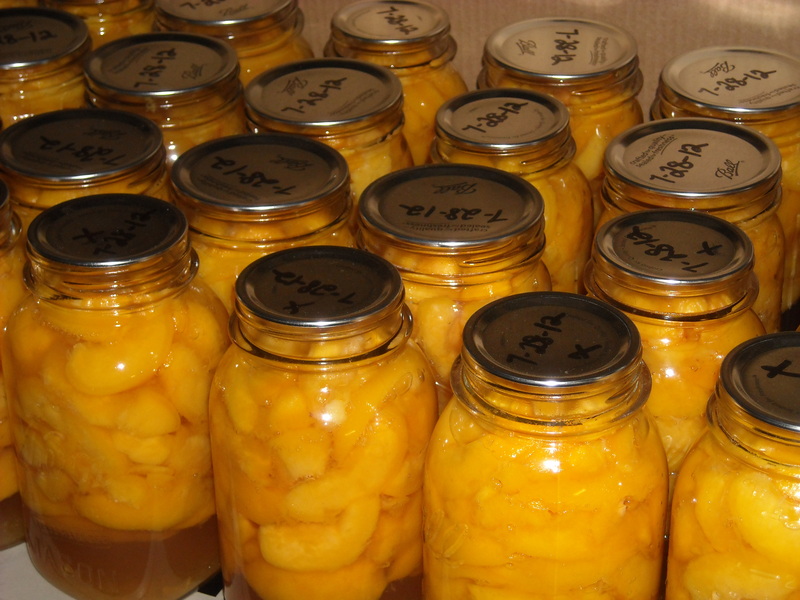 Once all of the peaches have been skinned and cut, you are ready to start canning. 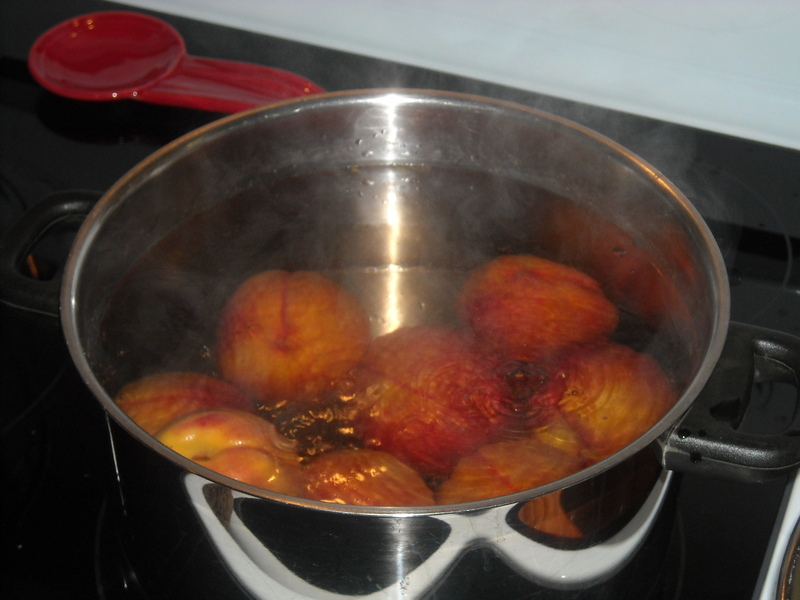 The picture above shows me preparing to drain the liquid from the peaches. You want to drain as much of this liquid as possible so that you can fill your jars with your hot sugar syrup. After draining the peaches, you can start filling your jars (your jars should be sterilized and free of chips around the mouth). This is the raw pack method. If you are doing slices, simply spoon them into the jars until they reach the neck of the jar. Do not pack the peaches too tightly or you will end up with unwanted air bubbles and a sticky mess in the end. If you are canning halves, lay them pit side down until they reach the neck of the jar. They will overlap and that’s alright. Once I have my jars filled (I fill 7 at a time because that’s what will fit in the canner), I set them around the canner on stove-top to help warm them before adding the boiling syrup. At this time, I also prepare my two-piece caps by placing them in a shallow saucepan and covering them with warm water. I bring the water to a simmer. This warms the seal in preparation for the canner. Be sure to have a pair of tongs near by to remove the caps from the saucepan. I use a light syrup for my peaches. The recipe for a light syrup is 2 1/4 cups sugar to 5 1/4 cups water. As soon as the syrup boils, it’s ready to use. Ladle the boiling syrup over the jarred peaches leaving a half-inch headspace. Be sure to remove any air bubbles before securing the lid by using a flat, non-metal spatula to gently press along the sides of the peaches. It is sometimes necessary to add a bit more liquid after releasing the air bubbles. Once the air bubbles are removed, place a two-piece cap on the jar and finger tighten. Place the jars in the boiling-water canner. When the jars are lowered into the canner, their tops should be covered by at least one inch of water. Place the lid on the canner and bring it back to a rolling boil. Process the jars for 30 minutes. 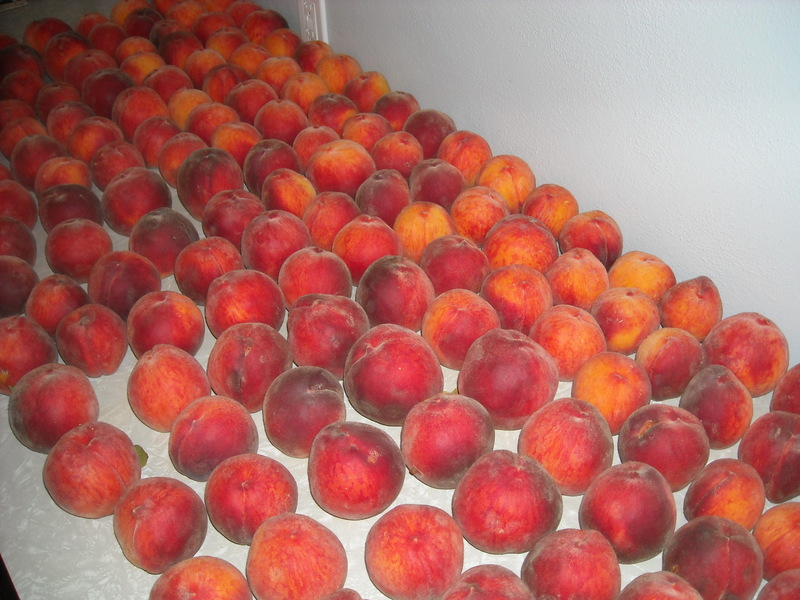 This year I processed 1 1/2 bushels of peaches which gave me a yield of 33 quarts. That should be enough to last the winter and gift to friends and neighbors. This entry was posted in Canning and tagged Backyard gardening, Canning, Cooking, Food, gardening, Homesteading, Organic gardening, Urban Gardening by M Riland. Bookmark the permalink. Thank you for your support. We really enjoy sharing our experiences. Lovely color …. do they stay that way for a long time? Yes, all winter. 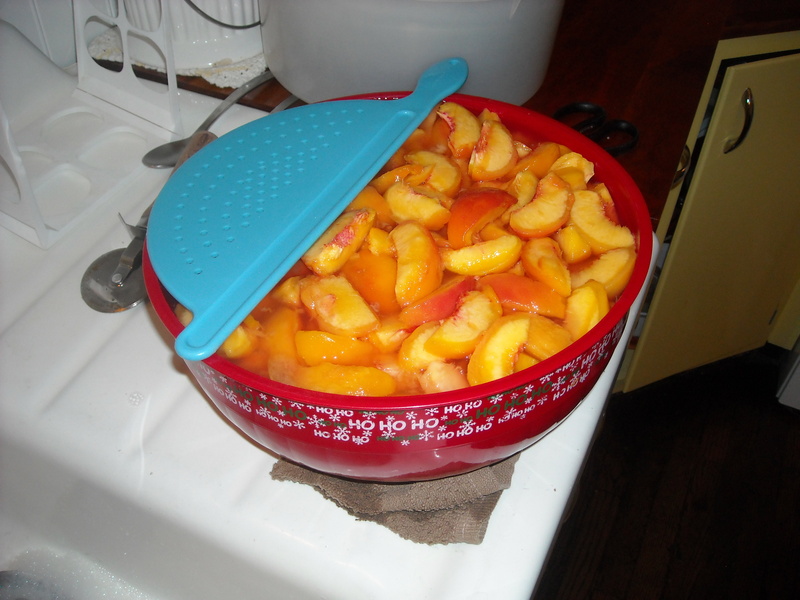 Letting the peaches soak in the fruit preserve keeps the color.